This is the next post in the series on my electric hot liquor tank. You can reference the intial post here. I want to reiterate my warning about mixing electricity with water. It can be deadly, and if you decide to venture into this, you do so at your own risk. This is just to document what I did, and is not meant to be any sort of expert opinion or instructions. So, if you get hurt, it is your own fault. The body of my EHLT is a 10 gallon aluminum pot I purchased at a restaurant supply store. They are easy to find, cheaper then stainless by a long shot, and for my purposes, much easier to bore holes through. I also bought the lid that fit it, which plays a role in the stirring mechanism, which I will cover in a later post. As you can see from the picture below, I put 4 holes in my pot, all close to the bottom. 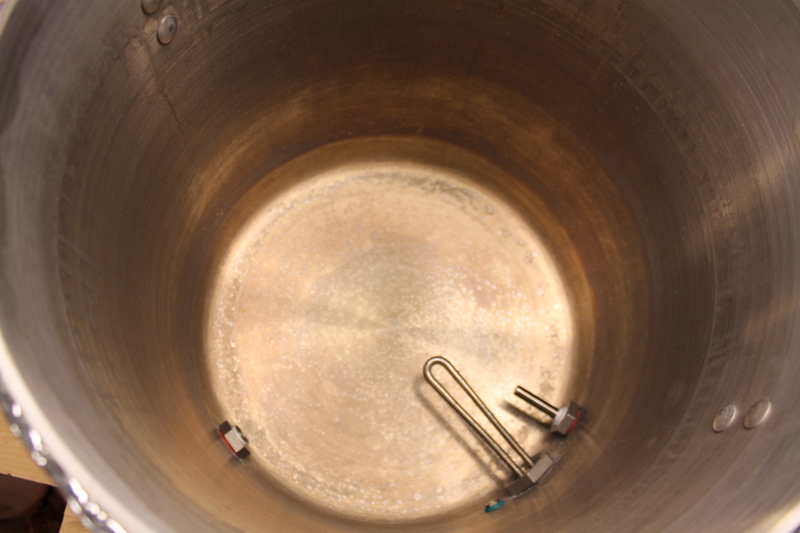 The ball valve is situated on the front of the kettle, with the heating element on the right side. Next to the heating element, on either side, are the holes I drilled for a stainless bolt for my ground, and the other is a thermowell. A thermowell is basically just a sealed tube that lets you measure temperature inside the kettle without getting water on the decidedly not waterproof probe on the temperature control unit. The thermowell and ball valve are fittings I bought online. The ball valve I purchased is here, with the brass valve, standard coupling, and the brass 1/2 inch barb. The thermowell is the 2.5inch option. The stainless bolt I just bought at the hardware store, with a high temperature washer (the green thing) a flat washer, lock washer, and nut on the outside. I have my ground against the side of the kettle this way, in a very secure connection. Also, if the ground ever comes off, for what ever reason, I will be able to see it easily and repair it. To drill the holes, I used a 1-3/8 step bit to cut a 1-1/4 inch hole in my handy cordless drill with some cutting oil from the hardware store for the hot water element, and a 7/8 step bit to cut 13/16 inch holes for the thermowell and the valve. The hardest part was deciding how high to cut the holes, as there is a slope on the base of the pot, and I did not want that to interfere with any of my fittings. I had to account for the thickness of the base of the pot as well as the slope when measuring how high to go for the holes. I used a the nut and washer to secure my element from here. I wrapped all the threads in teflon tape, and just tightened everything down until I had no leaks. Also, I did not secure the element until after the wiring was done, which I will go into in another post. You can see from the picture of the tank in the first post it is covered in a foil coated bubblewrap for insulation. However, this was added at the very end, once everything was finally assembled. One final note, on aluminum in brewing. I have not come across what I would consider good information on aluminum being dangerous. As you can see from the picture inside, I have an oxide layer built up. This happens naturally with time, water, and heat. This is inert, and as this only holds water, I never scrub it out. I just dump any excess water and wipe it out with a dish towel when done, so I never disurb the oxide layer. Aluminum has been used in cooking for a long, long time without any reasonably documented negative effects, so I am not worried about it. Relax, and have a homebrew!